So, here it is. 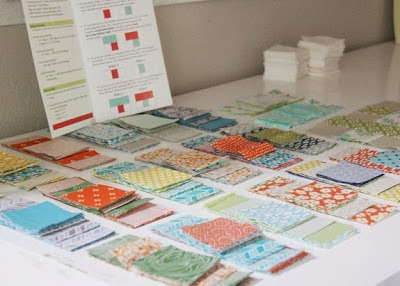 The post that started my spiral into cleaning, organizing, and decorating again. Happy reading! Choosing a favorite blog is like choosing a favorite children’s book author. Each time I take out a new book, in my classroom, I tell my kids that this is truly my favorite author. Usually, I’m met with several eye rolls and kids saying, “You always tell us that this is your favorite author!” It’s true. I have lots of favorites. I cannot pick just one. Well, I feel the same way about blogs. Each time I come across a new-to-me blog with gorgeous photos, a style that I strive for, or inspirational projects, I decide that this must be my new favorite blog. Although, I must confess, I never really let go of my old favorites. 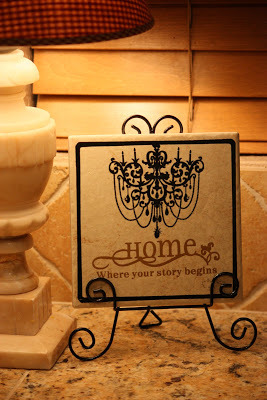 So, today, I’d like to share my favorite home decor… right now. I guess I’m adding them to my list of favorites. First up, is my most recent addition to the favorites list. Golden Boys and Me is a blog I connected to in many ways. 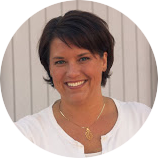 The author, Courtney, is a teacher (once a teacher, always a teacher in my opinion) who now stays home with her family. I love her style and photography. 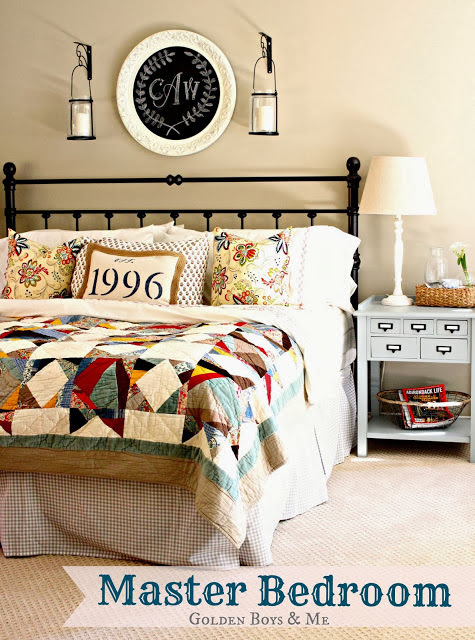 There is a warm and coziness to her home decor, but it’s light and bright at the same time. 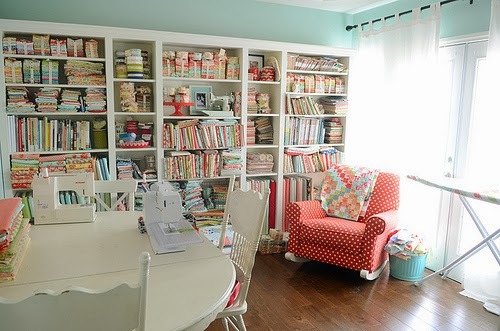 I tend to struggle with the combination of the two in my own home, so I admire her decorating style. I think I need to scour Goodwill for a tray like the one below and create a display like this on my ottoman in the living room. Or maybe I’ll just wait until Christmas and see what she comes up with then. 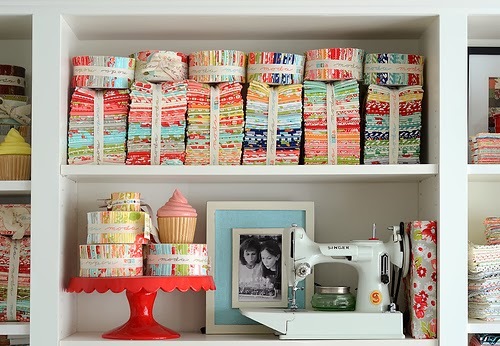 I spotted this photo last week on the Pottery Barn blog. Let me tell you, friends, I have a blank wall above my bed and a white bedspread with very little color in the room. My bedroom is screaming for this look! 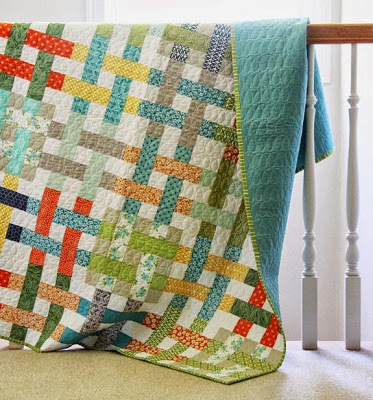 I know the Pottery Barn quilt was part of the inspiration for this look, and I don’t actually own this particular Pottery Barn quilt, but I may have mentioned a time or two that I’m a quilter. 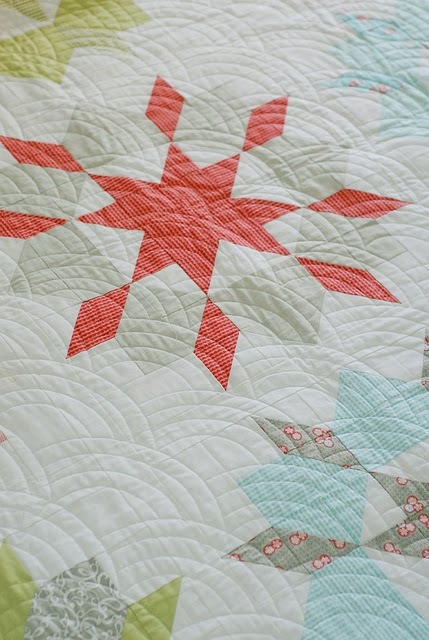 I see a jewel toned, scrappy, star quilt in my future! When I post a similar looking bedroom photo on my blog in the coming months, you’ll know where the inspiration came from! Now, we move onto Finding Home. Seriously, I think Laura could be my BFF. She just seems like a fun person who I would love to hang out with. Again, I love her style because it’s warm and cozy, but still light and bright. I love the way she uses natural materials in her displays. 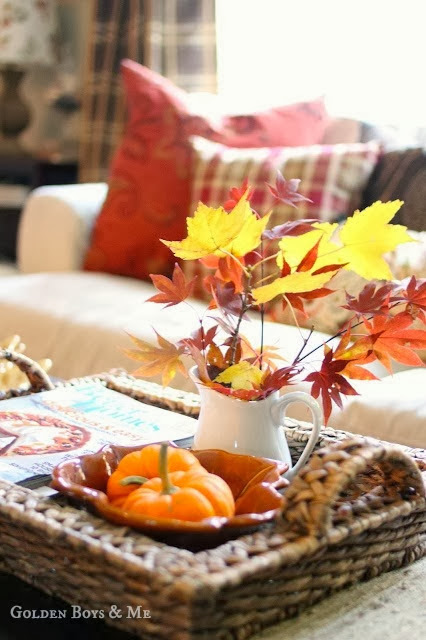 At my house, I have a great wooden box sitting on my dining room table, a bundle of wheat, and a few other fall items. 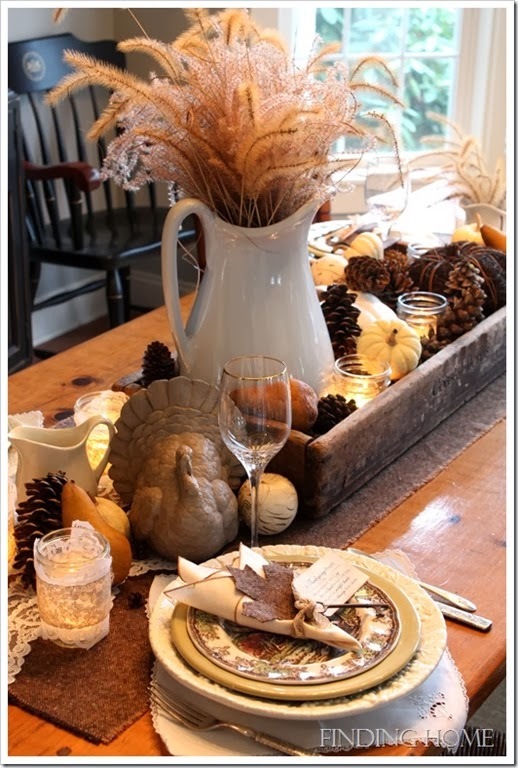 You may be wondering why I’ve never shared a picture of my fall table display. Well, it doesn’t exactly look as pretty as this one. Mine is kind of a “Pinterest Fail” look. I’m not even going to keep trying with the fall display. I’m just going to move right onto Christmas. What are we putting on our Christmas tables, Laura? I’ll try whatever you do! Her living room is gorgeous! I love her home because it’s custom, but it didn’t start out that way. They moved into a builder-grade home and have gradually made it their own. They’ve made it special and unique. The first time I found this blog, was through Pinterest. 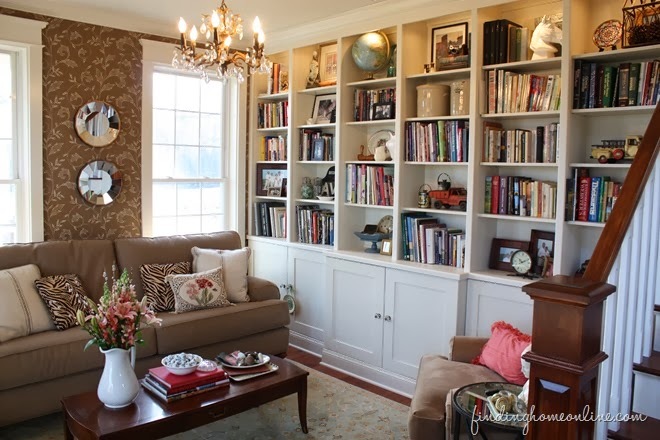 I spotted the picture below and pinned it, because I’d love to have built-ins like this in my own living room. So, there you have it! These are my favorite Home Decor blogs right now. I eagerly await their posts each day (or every few days) because I know there is inspiration right around the corner! If you have a favorite blog, please leave a comment about it in this post, even if it’s your own! I’d love to hear about it and why it inspires you. 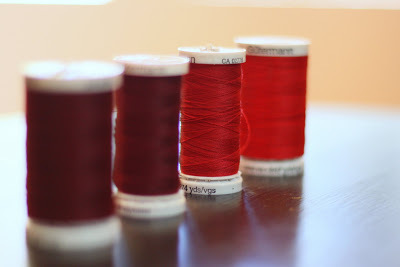 I’ll be sharing my favorite sewing and photography blogs later in the week. I’ve been in love with Mariah’s Playful Learning blog and website since I discovered them. If I happened to be a more adventurous person, I’d quit teaching (in the traditional classroom) and do what Mariah does. 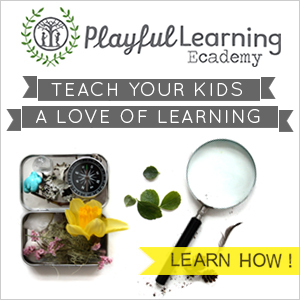 I’d teach parents and kids together, to love learning and continue to explore playfully. 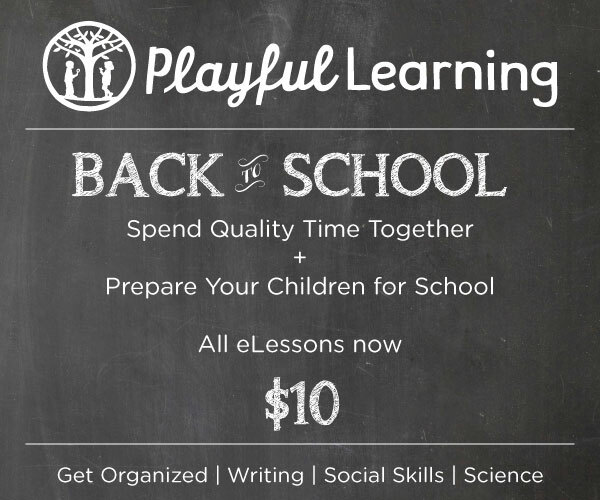 I’d develop lesson plans and guided practice to help parents create playful learning projets and environments in their homes. Doesn’t that sound wonderful? Maybe someday. 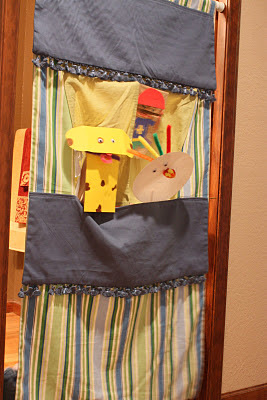 There is a new class on creating a Writer’s Notebook with your child that I’d dying to take! I love all of her science learning opportunities too. Check it out! 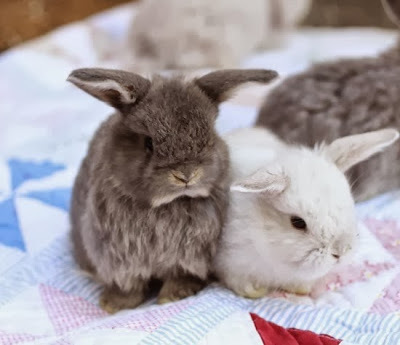 I think you’ll love them as much as I do! Click on the pictures to take you there. 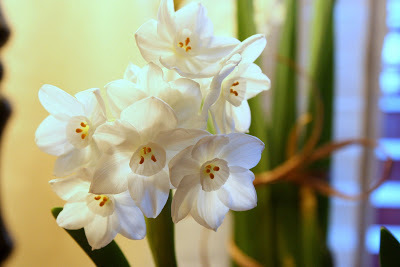 If you haven’t done this already, it’s time to plant Paperwhites! Oh, by the way, if you didn’t read my story about the Kindness of Strangers, be sure to check it out. My RAVE in the Seattle Times, last November, was chosen as one of the top 10 raves in 2011. 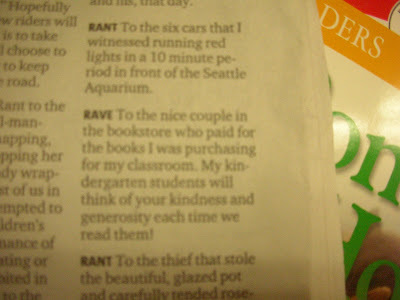 Yeah to the kind strangers I met in the bookstore!!! Are you ready to link up? 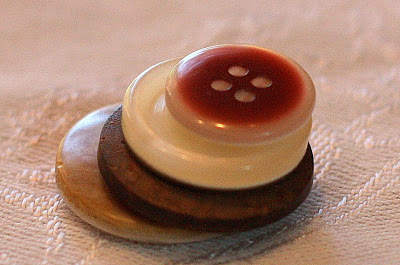 I’d love it if you’d grab my button and become a follower. 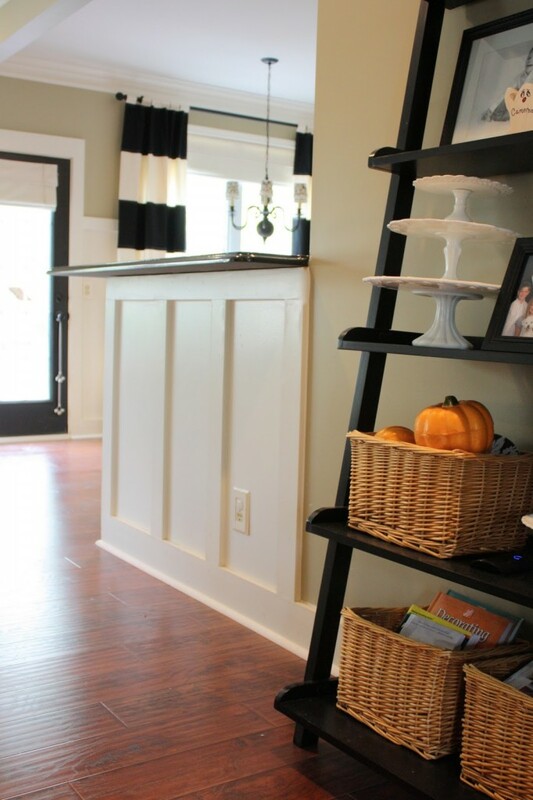 Did you see this great bar makeover at our linky party last week? This was posted on The Yellow Cape Cod and boy was I impressed! I know you were too because it was the most clicked on link last week! Click on over and enjoy your Sunday evening! I’ve read your blog forever and feel like we’re BFF’s. That’s why I just call you P-Dub instead of Pioneer Woman. We’re like THIS. (I’m crossing my fingers to show you how tight we are.) I can’t even begin to tell you how excited I am about your new cooking show on the Food Network. I’m excited for myself, becauase I get to see you each week, meet the kids and your hubby, and spend time with you in your kitchen. I’m excited for you, because, well, you’ve made your dream come true! You are the host of your own TV show!!! You’re awesome, P-Dub. Thanks for taking me to church with you this week. Oh, and you’re paying way too much for blackberries. I noticed they were $4.99 at your store, but I can pick some for you at my sister’s house. Free! I still don’t know what state you live in, but I’m sure they wouldn’t be too smooshed if I shipped them to you. You’re my idol. (Although I don’t have dreams of my own cooking show. No one would like the boring meals I make.) I’ll just keep tuning into your show each week for inspiration. It’s back to school time, friends. Life has gotten a little crazy. Fifty new kindergarten friends are excited to experience the joys of school life each day. They look to me, hoping their day will be filled with laughter and learning. Let me tell you, it’s a lot of pressure! My blogging has taken a back seat to planning, room arrangement, and professional reading. Yesterday, I decided to reclaim my own joy. My hubby bought me a new lens for my birthday. It’s a 50mm f/1.8 Canon. Everyone who has one of these says it’s the best. I love the way it really blurs the background. 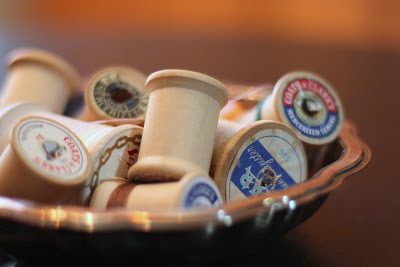 I worked on a few sewing projects in my spare time, and had to snap a picture of my sewing supplies. This fabric is actually for a school project. It was so beautiful, I had to take a picture of it. I LOVE Cheryl’s blog. She writes over at A Pretty Cool Life. I fell in love with her gingham buntings and decided I wanted to use this idea to make a color words wall in my classroom. I have no idea where she found her gingham fabric in every color of the rainbow, because as far as I can tell, it is no where to be found in stores or online. So, I went with the next best thing… polkadots. 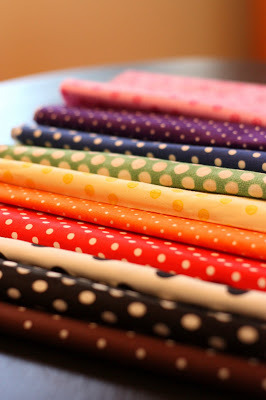 My favorite quilt shop had a beautiful selection of polka dots. The first week of school is behind us. My kids are in 5th and 1st grade. They are settling back into the routine of school, homework, sports, and earlier bedtimes. I’m settling back into the routine of greeting smiling 5 year old faces, eager to see the fun I’ve planned for them each day. One thing that’s harder for me to settle into is finding time for the things I enjoy. I need to remember to sew, write, organize, take leisurely walks, enjoy the view of my garden when I’m sitting on my deck, cook dinners inspired by the Food Network, bake for no reason at all, and make sure I get to yoga on Monday nights. Home and Family Friday will be below this post. It’s funny, when I started this blog I didn’t expect to make new friends. I had read about bloggers who found new friends and a supportive community group through blogging. I didn’t really understand how that could happen. I couldn’t imagine having a “friend” who you had never met. Well, I was wrong. There are certain people I feel like I know. We have regular conversations (through blog comments). I follow along with their home life adventures, challenges in life, and celebrations. You know… like real friends. Thanks, Rebecca! I LOVE this! It is such a thoughtful gift. I put it in my kitchen and I’ll think of you every time I see it. By the way, real friends send real-live thank you’s, so a proper thank you is in the mail!